In 1992, professional portrait photographer A. Mack Sawyer of Elizabeth City, N.C. took this photo of Chet. It was originally given to only four people, Chet's wife Leona, his daughter Merle and two grandchildren, Mandy and Jonathan. 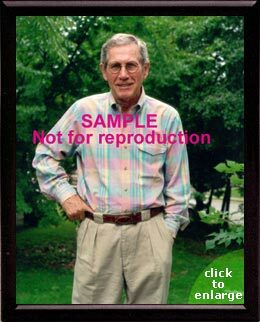 Now, by permission of the Chet Atkins Estate, a limited number of 5x7 copies are now available, suitable for framing. These prints are mailed flat, between cardboard sheets for extra protection. International customers (except Canada) please email us for postage costs to your address. include your email address. Allow 7-10 days for delivery.